Preparing the bed is an important step in the planting process. Your first consideration will be to remove vegetation currently growing in your area. Techniques for this activity are: sun solarization, chemical treatment, or the old fashioned method of digging them up. Each has some benefits and disadvantages. Earth-Kind uses research-proven techniques to provide maximum gardening and landscape enjoyment while preserving and protecting our environment. Integrated pest management (IPM) is an environmentally responsible and economically practical method of controlling lawn and garden pests. It is a method that has been researched at Texas A&M. A well-designed landscape gives pleasure to the owner, enhances a community, adds to the resale value of the property, and limits the environmental impact of care and maintenance. 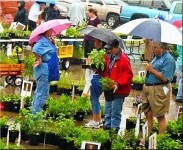 Plant selection can be an overwhelming task if you have not done your homework. Nurseries and Garden Centers are full of colorful, blooming plants just waiting for someone to grab them and take them home. The temptation is almost irresistible. When living plants are allowed to decompose over time, the result is an incredibly rich and fertile soil amendment that we call compost. Fully composted organic material is the most beneficial element you can add to your soil. Parker County may be known for its peaches and crape myrtles, but it's not because of our fabulous soil. This County has some of the most frustrating and unusual soil combinations in the entire State. 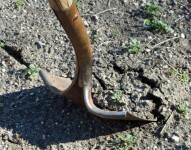 Because of this, it is important to assess your soil before you select plants for the landscape. A landscape designed and maintained according to good horticultural principles that allow for a beautiful healthy landscape with minimal supplemental irrigation and little or not runoff from the landscape. Prune bush roses by half, always pruning just above buds facing away from the centers of the plants. Last average killing frost date is March 16th. Be sure tender plants are covered during cold nights.